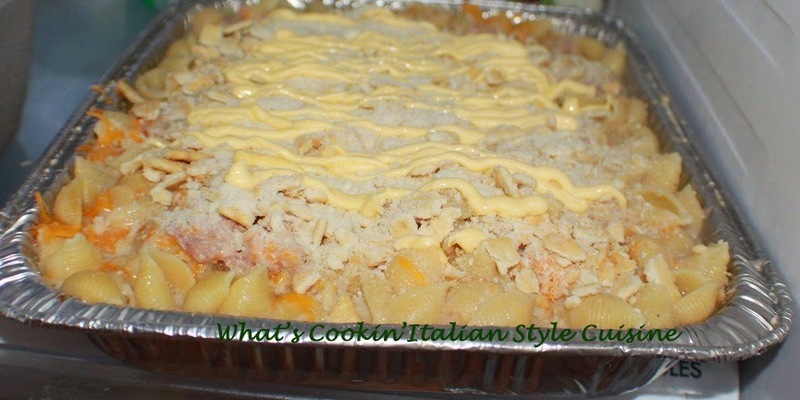 A perfect and easy casserole to make for a crowd or just make this pan full and freeze for later. The leftovers are fabulous reheated and freeze well! These combination of flavors are sure to wow your family and guests! I have taken this one to many functions always a big hit! Check out how easy and oh so flavorful! In a large saucepan add 1 tablespoon butter and then garlic saute for 1 minutes. Add the flour and fry 1 minute add the chicken broth, milk 2 tablespoon butter garlic powder, Worcestershire sauce, Sherry and simmer to make the medium thick sauce. In the meantime cook the pasta al dente. Add the rest of the butter in a 13 x 9 pan and put in the oven to melt the butter swirling around. Add the drained unrinsed pasta to the butter dish. Toss in the cooked chicken. Pour the sauce over the top. Sprinkle with cheddar, parmesan cheese. Top with butter crackers drizzle some butter on top and bake at 350 for 1/2 hour or until heated through. I'm bookmarking this. Sounds Great! What a great recipe! YUM!